Black and White and Loved All Over: 10 Years. When I think about meeting Nekos, I think about how much my life changed instantly and how close I was to not meeting him at all. And what if I hadn't met him? Would I be living here in Nashville? Married to someone else? With children (... but surely not children as painfully beautiful)? Single? How might my career have panned out differently? Would I be as happy? Happier? What if I hadn't lived all this time in the spotlight of his support and attention and slept next to him for the past decade, and where would he be without me to nag him about his diabetes and to laugh at all of his jokes and tell him how fantastically adorable he is? Nekos and I have been looking forward to this particular anniversary for a long time. We can't remember the exact date, but we met in August 2002--10 years ago this month. It took almost two months after that before he would pull me into a room at a party, press me against a wall thumping with music and kiss me, and still another couple of months before he asked me to be his girl. (Yes, emphatically yes! On Nekos's arm, I felt like I sparkled, like the possibilities were endless. I felt loved, as is.) On New Year's Eve that year, he called me up and shouted over the din where he was celebrating, hundreds of miles away, that he loved me. Our story may very well be unremarkable to anyone other than me and Nekos, but it is our story and we are both grateful that we have it to tell. 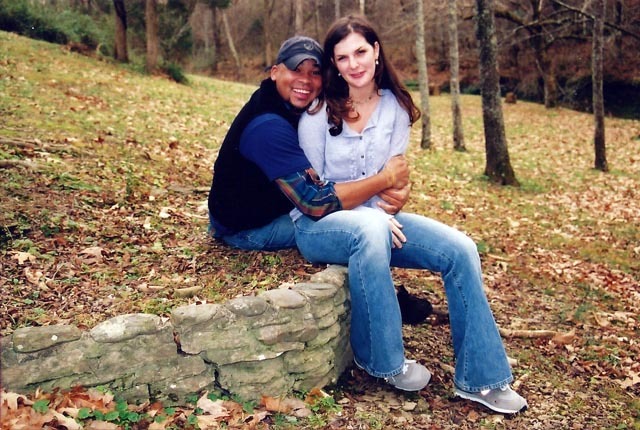 We met at the tail end of the summer before my junior year of college at UT Knoxville. I had just changed my major from journalism to English and was writing lots of poetry and working for the school paper and the literary magazine. I had grown to love being a college student and was straddling the line between totally reckless and very conscientious and doing it pretty well. After two years of living in the dorms--one year with a roommate and one year in a tiny white room by myself--I had just moved into a studio apartment at the top of a long flight of stairs attached to a building so dilapidated that it literally had a lean to it. I was 19, and I was thrilled. I'd spent the entire summer picking out paint colors and saving up for the bedding I wanted. I even brought a gray-and-white-striped kitten named Willow to move in with me. The week before school started my friend Michelle and I decided we wanted to have extra money that semester for drinking and clothes-buying, and were talking about it one afternoon as we walked down Knoxville's Strip. Out of the blue she suggested that we apply for jobs at McAlister's Deli, which we were just passing. We both went in to fill out applications. She ended up not taking the job, but I did. Nekos had worked at McAlister's for a few years already and had one semester of his senior year in college left. He'd also just put in his two weeks notice. I don't remember first laying eyes on him, but I remember the way he made me feel, which was alive and uncomfortable in a good way. I remember him telling me that he liked my hair a certain way and my doing it that way every shift after that. He teased me, teased everyone, but was also warm and smart and funny. He was messy around the edges. Most of the girls I worked with liked him, loved him even, but some of the guys didn't. His personality, which was (and is) as big as the music he blared from the back of the kitchen where he steamed sandwiches and baked potatoes for customers, wasn't for the faint of heart. I told all of my girlfriends I had a crush on him, but the truth is I always had a crush on someone. Whoever I had most recently smooched at a party or walked beside after class. I could find something to adore about almost anyone because I wanted so badly to have a boyfriend. I had never had a boyfriend before. At least no one who I "dated" for more than a few weeks and no one who ever liked me nearly as much as I liked them. Nekos in the meantime was suffering through the aftermath of this short-lived but really intense relationship he'd had with a beautiful blonde hippie girl who went to Widespread Panic concerts with him and drove him insane in the best sense of the word. When one of my girlfriends told him I liked him, he wasn't very impressed. I don't know what changed things, but the flirtation soon got dialed up to the highest degree. And he kept surprising me in new ways; was he really playing Liz Phair on the stereo at work? Most famously, we got into a food fight in the back of the restaurant, and I ended up chasing him, squealing, out the door of McAlister's, down the street, and into a Walgreen's where we ran up and down the aisles, covered in food and giggling. And still on the clock. After that, there were dates and dancefloors and lots of nights and mornings. We fell in love with one another. We still are. Having known each other 10 years, Nekos and I have literally grown up together. And as two only children we often say our relationship has given us the sister or brother that neither of us ever had. We've had bad times, terrible times, and sometimes they've been both of our faults and sometimes not. We've seen each other through torturous jobs, through promotions and firings, through a move to Nashville, through personality differences and stupid decisions and bad habits and bad health and ugly hair cuts. We moved into our first apartment together and rattled the walls with our fights; we planned a wedding and said "I do!" so enthusiastically that our friends and family laughed. We bought our first home together, where we've remained pretty consistently very happy for the past five years. We had a baby together and learned to feed her and put her to sleep and to love her and to support one another as parents. Soon we'll have another baby. Mostly we've had a hell of a lot of fun together. We've cooked meals and hosted parties and taken trips and never stopped even for a second loving one another. I am so, so, so grateful for Nekos and for our 10 years together. This story, his and mine, it's my very favorite. Happy for you two! Good to see happy couples these days! I wish you at least 10,000 more happy years!!! This is such a lovely story, very sweet! Your girls are going to love hearing it when they are older. Here's to 100 more wonderful years! beautiful! congratulations and here's to many, many more years of all of the above!! happy anniversary! my husband and i celebrated 10 years together this year as well. I know what you mean about growing up together. here is to 60 more years! "he would pull me into a room at a party, press me against a wall thumping with music and kiss me"
^^ such a scene from a romantic movie! Also, I met H when I was 18, we married when I was 19. We celebrated 14 years of marriage in June, and your story just took me back to all those early days. "personality differences and stupid decisions and bad habits and bad health and ugly hair cuts"
This was fantastically sweet. I think people forget how life sweeps you up into a tornado and just drops you down when it chooses and so we often forget the little things. Happy 10 years! I don't know you and you don't know me...but this piece made my heart happy! What a beautiful and truthful excerpt from your lovely life! Congrats on 10 years together! Wow. Seriously beautiful. I hope to someday have that passion behind my words like you do. Congrats on 10 years. I hope you two have a million more beautiful more years ahead! Made me weep happy tears for you two and for Tessa and Livvy! There's nothing better that parents can do for their kids than to love each other. Please write another blog this anniversary month in which you remember in detail all of those amazingly romantic things that Nekos (and you) did in the beginning of the relationship (and later and now)! Before you forget!